Ever wonder what happened to that bike that got away? I once had a 1964 Sears Allstate (Vespa) scooter that haunts me still. 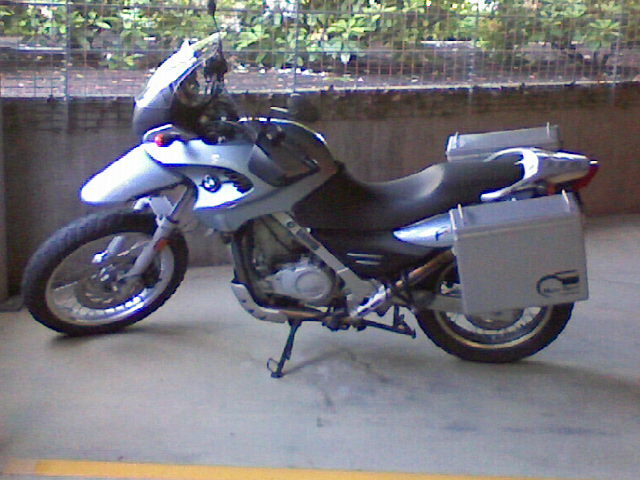 And, I have a particular fondness for my first BMW, a 2001 F650GS in titan blue. I bought the bike in 2004 from Sparks, NV (http://www.sierrabmw.com/) from a salesman named Lane. We did everything online and sight unseen I traveled from Salem, OR to Sparks to pick up this beautiful bike with only 1688 miles. My boyfriend at the time rode it from the dealership as I was too scared to ride it through the mean streets and traffic. Once out of town I got on the thing and rode like a granny all the way home. We went around 500 miles in one day...the first time I'd ever ridden anything other than a scooter for more than an hour. As you can imagine, I wasn't prepared. It rained like crazy for probably 100 of those miles and I had just my moto jacket, ski pants and tennis shoes keeping me warm. Every time the wind blew it felt like I was going to tip over and by the time we hit my parent's house in Lowell, OR (about two hours from Salem) my fingers were permanently stuck bent. I have bragged that since I survived that ride I know I can survive anything. Eventually there was a parting of ways with the boyfriend and the bike. I sold the bike with about 6000 miles on it to a man who lived in Corvallis, Art. (The boyfriend, well I wish I'd have gotten some cash for him.) About a year later I checked in on my old blue bike and Art said he was looking to sell. I did the only logical thing and bought the bike back (he'd put around 2000 miles on it!). Reunited again, I vowed never to part. We rode and rode until one day a big blue R1200 GS caught my eye. I know it was wrong but still I did the unthinkable. I bought it. Sitting side by side in the garage the 650GS (now with 18,000 miles) and 1200 GS (2 miles) were the most beautiful things you could imagine. But I knew our time together was short and that I clearly did not need to keep the 650. So off the bike went again. This time, to Washington State. Farther out of my mind and grasp. The other day I emailed the lucky guy who bought the bike and found out my beautiful blue 650GS was no more. 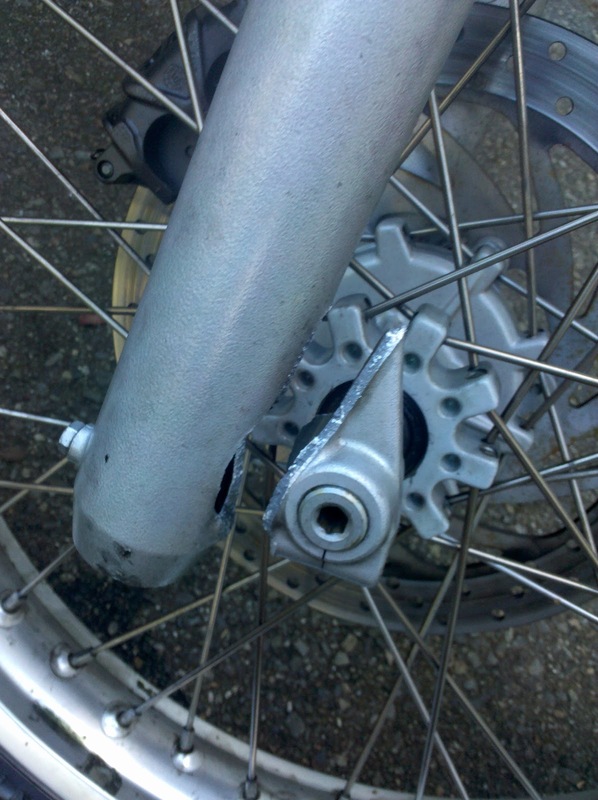 He experienced a major malfunction of the fork at the axle hub while riding at about 10 miles per hour and went head and shoulder first into the pavement. An injured shoulder and one totaled bike later the blue GS has passed beyond my reach. It turns out the guy I sold it to was lucky...to not be seriously injured in the crash. And I, well I count myself kind of lucky that I sold it. I had no idea when I sold the bike to him that there had been reports of issues regarding his problem on the forums. (see Adventure Rider, http://www.advrider.com/forums/showthread.php?t=393785 for more information) And not one dealer had ever mentioned, during service or otherwise, that this could happen. I guess anything can happen when you ride but one doesn't really expect danger to be lurking on the bike instead of around the bike. Based on what I've read the 2002(ish) and earlier bikes are only the reported ones with potential issues and BMW has since slightly redesigned and reinforced the area in question. I can only hope that's the case, especially since I'm now riding the 2010 version of this bike! Farwell my Titan blue baby...farewell. That was a harrowing first ride! Sad ending though, but I'm glad it wasn't worse. Isn't amazing how your perspective on riding changes in a relatively short period of time? Do you even "know" that girl who rode home in her ski pants anymore? Hardships can really have a sweet quality in hindsight. HOLY CRAP on that broken fork. Thank goodness the new owner wasn't hurt badly. Scary stuff. Fuzzy, I don't think I do know that girl! The me now is zipping in and out of traffic and hoping for a long journey so I can have fun and test myself! Thank gosh we all grow and learn from our mistakes! I'm replacing the forks on Mrs Nikos' newly acquired 2002 F650GS as I would never forgive myself if she flew over the handlebars! Hope you didn't take too much damage! What we expect from BMW,it reflects in the super-bike BMW F650.Its designed to beat the other super-bikes on grounds of speed,looks everything. BMW are a German based car maker and appropriate from the very beginning they over designed their cars they kept things basic and they manufactured a notoriety on great administration and solid cars.